This data is confined to incidents of serious crimes other than sexual violence offences which are recorded and published separately. 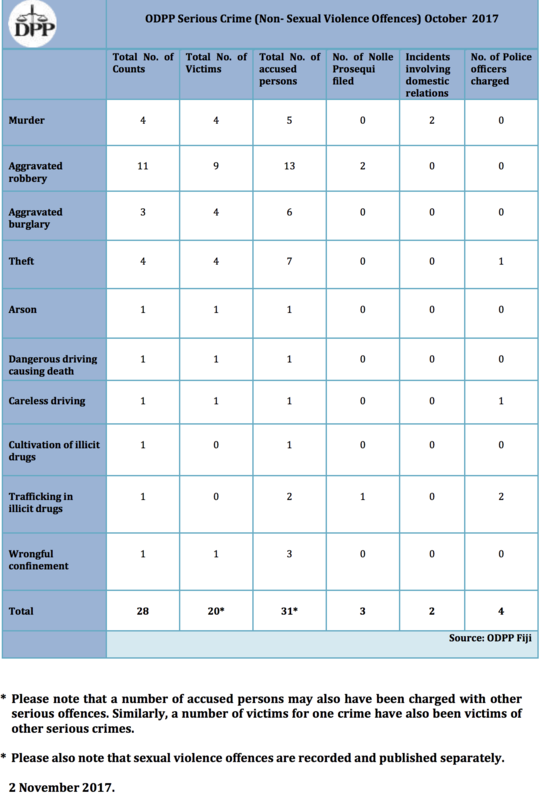 This data also includes offences committed by police officers. There were 31 people charged with a total of 28 counts of separate incidents in October. The offences were murder (4) aggravated robbery (11), aggravated burglary (3), theft (4), arson (1), dangerous driving causing death (1), careless driving (1) cultivation of illicit drugs (1), trafficking in illicit drugs (1) and wrongful confinement (1). Of the 31 people charged, four were police officers. One police officer was charged with one count of theft of $13, 311.43 while another police officer was charged with one count of careless driving. Two police officers were charged with one count of trafficking in illicit drugs namely cocaine. A Nolle Prosequi was filed in this matter after the drugs exhibit went missing. Four men were charged with one count of murder each. A 25-year-old man was charged with the murder of his 47-year-old mother after he allegedly pushed her on the road in front of an oncoming motor vehicle. In another incident, a 47-yearold man is alleged to have murdered his 42-year-old brother in law with a broken bottle. Two men were charged with one count of murder of a 28-year-old where a 4 x 2 timber was used as the murder weapon and in another incident a 32-year old man was charged with one count of murder of a 28-year old man where a knife was used as the murder weapon. One man was charged with one count of dangerous driving causing death. He is alleged to have hit a 54-year-old man with his motor vehicle while the victim was crossing the road in Nausori. 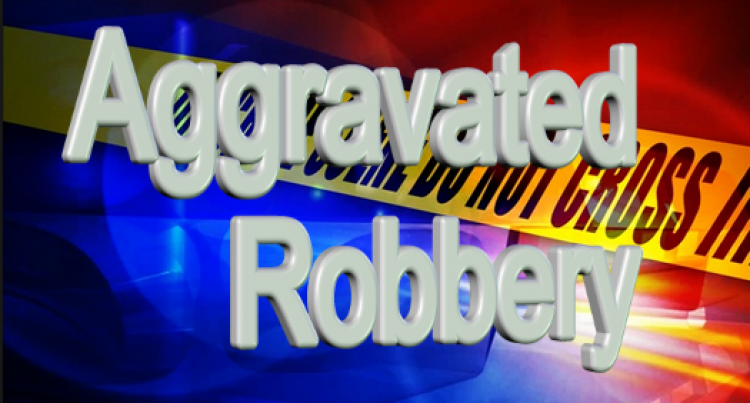 Cash amounts ranged from $150 to $2,000 while $80 to over $275,000 worth of assorted items were stolen during the alleged aggravated robbery and aggravated burglary offences which were home invasions, resort break-ins and daylight street muggings. Three men were also charged with one count of wrongful confinement of a 65-year-old man during an alleged daylight robbery incident. There was one incident of arson where the victim’s house was burnt to the ground in Kinoya. One farmer was charged with one count of cultivation of an illicit drug. He is alleged to have cultivated marijuana weighing up to 34.2 kilograms. Three cases were withdrawn after discontinuances (Nolle Prosequi) were filed. One case was withdrawn following a review of the evidence while two cases were withdrawn after evidence went missing from the Police Station. Refer to the table entitled ODPP Serious Crime (Non-Sexual Violence Offences) Statistics October 2017 for a break-down of these statistics.